The WOPAJO WAR CRY'S Historical Library is crammed full of pictures of Albuquerque as it was in the 1930's. These pictures show Old Town as people who remember the "Great Depression" and who lived in New Mexico remember. The rest of the "City" was not very much better. The main "Business "district included Central Avenue from about Arno or High street, to about Seventh or Eighth Street, with no more than about three or four blocks of spill over on either side of Central and the rest, for the most part was unpaved. Running water, phones, electricity, indoor plumbing, garbage pick up, and public transportation was very limited and very few people had cars. The business district, "New Town, or "Uptown,"as it was called, had all those things and more. Bars, paving, side walks, several five and dime, and department stores, cafes and a few restraints, offices, one big one-the El Fidel, and several movie houses, an opera house. The Armory doubled for so many other community activities that to list them here would take most of one column, but the octopus that was to become a city was just starting to spread it's tentacles. We knew that progress would make life more expensive, but with progress would come jobs, people, and earning opportunities with which to rise to the challenge of new expenses. If other parts of what is now the city were wanting, Old Town was in the doldrums. Not only didn't we have the modern convinces, but there was absolutely no hope of obtaining them in the near future, progress was putting a false front, a veneer, on the more visible parts of town, those that were new comers and tourists were more apt to see and get to the rest as finances and available resources COMMANDED. 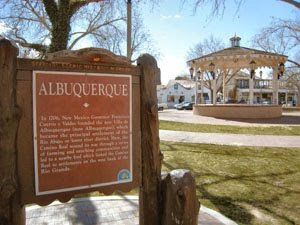 After the boom that the railroad had brought in the housing, the railroad shops, stores, bars, theaters, etc., business showed up but still, Albuquerque did not fold up during the depression. With the railroad depot close by, and being at the cross roads of Highways 66 and 85 that helped. Cross Country traffic stopped here long enough to buy food, drink, souvenirs, clothing, and many of the necessities of the road. Motels and Hotels for a night's rest, filling stations, and garages could count on some business from people who migrated from East to West and Visa Versa, but Old Town had only the Blueher Farm and the Saw Mill . The Saw Mill staggered badly, but it didn't go down. Blueher's truck farm did bite the dust, and Old Towners, lost their jobs. Much Later Navajo Trucking moved in there, the mansion became what is now La Hacienda Restaurant, and the shops behind it. but in that was years later, in the 30's and forties, even into much of the 40's what you see now as Tiguex Park and the Museum directly east of La Hacienda, was deserted and dead. A care taker family lived in part of the property but other than that, to our knowledge, that, and the Mann Farm North of Tiguex Park were the two greatest losses Old Town suffered. The Saw Mill was not in Old Town, but it was one of the best paying jobs within walking distance of Old Towners.